Even if you don’t follow tech news regularly, you have probably clicked on a post about the annual Consumer Electronics Show—even if it was just to check what this #CES2015, which didn’t leave the Trending bar on Twitter all week, was all about. Social media feeds were teeming with discussions of “smart” washing machines, 4X TV screens, and selfie sticks. Out of all the conversations on multiple social networks, a digital marketer may be stumped to find trends relevant to their field among all the newest gadgets. To help you navigate CES 2015 with all the drones, wearables, wearable drones, and everything in between, here are the highlights of trends that can help a social media professional in the new year. Tech reporters at The Verge and Gizmodo were quite taken with FlapIt, a social media stats counter with a slick retro design. FlapIt shows off social media metrics such as the number of likes, follows, or stars, and has the capacity to connect to several major networks. 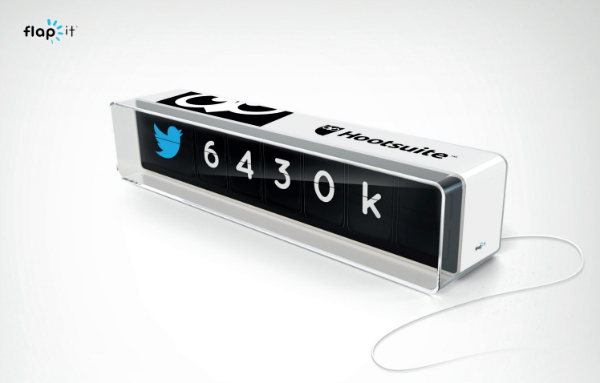 It’s the first physical counter for social media stats, designed in the style of 60’s split-flap clocks. FlapIt’s selling point is the instant access to the necessary metric, in a physical space; something businesses can put in the display window or on the office desk to show off their social media savvy. While we have emphasized the importance of focusing on the followers that count and not the follower count, having a physical counter sounds like a great way to track important metrics in real-time without having to set up notifications or constantly hitting Refresh in the browser. While FlapIt is the first of its kind (and fairly pricey for a novelty counter, to boot), it’s likely to kick off a trend for gadgets taking metrics from the digital space into the physical realm. Speaking of different realms: according to writers at Social Media Today and LiveScience, the overarching theme of this year’s CES is also the one trend marketers should care about. While CES 2014 was all about smart objects and the Internet of Things, this year’s gadgets displayed at the show are part of the new Internet of Me—a term used by chief economist of the Consumer Electronics Association, Shawn Dubravac, in his book on future digital trends. This term is used to describe the rise in popularity of various wearables and tracking software, which provide users with various data about themselves and their activities. Dubravac has summed up the theme of CES 2015 as “digitization of physical space,” as everyday-use objects such as dog food bowls and hairbrushes get equipped with a wi-fi connection and become easy to operate using your smartphone. According to Rohit Bhargava, Internet of Me and the phenomenon of digitization of physical space is a gold mine of opportunity for marketers. All the data collected from people’s daily lives through “smart” technology can fill in the existing gaps in the marketers’ understanding of their clients’ needs; this information can help marketing professionals tailor products and services to personal data their clients chose to disclose. In other cases, however, you don’t need to collect data from each individual to get a clear picture of something; instead, you can distill the important information from a collective feed. The anonymous messaging app, Secret, has created a feed exclusive to CES attendees and those in the immediate Las Vegas strip area, with the purpose of discussing conference-related topics with others nearby. The idea is to enable users attending CES to share messages that may be too “insider” for their social media audience, such as inquiries for recommendations of the best displays to visit during the show, or complaints about the hotel rooms. Secret’s co-founder Chrys Bader-Wechseler told TechCrunch that there hasn’t been a good way to get all the necessary real-time information at a conference in one place. Thus, a temporary backchannel such as the Secret feed can be a good outlet for all the conference inquiries that would be too noisy for a mainstream social network, such as Twitter. A similar event-specific feed was set up at last year’s SXSW, and Bader-Wechseler hinted there may be of those in store for his app in the coming months. We have seen the rise of location-specific anonymous messaging with Yik Yak, and boards tracking Twitter activity with the event’s hashtag—Hootsuite, for example, offers a customized Tweet wall called HootFeed; CES 2015 had its own social media command center operated by BuzzRadar, which tracked social media activity surrounding the conference. Event-specific feeds are not unique to Secret; Snapchat, for example, has had its “Techies in Vegas” Story updated with Snaps for the duration of the conference, turning the phrase into a trending Twitter hashtag. But the idea of having an anonymous location-specific, temporary feed with access limited to people in the area is new ground for real-time online discussions. So event marketers, take note: while the CES exclusive feed may seem tailored to tech-savvy reporters, the potential of this type of real-time event communication is worth considering. Okay, so maybe not all marketers have to be reminded about the renewed power of instant messengers—with WhatsApp and Facebook Messenger reportedly being a major source of “dark social” traffic to most web sources, and more time spent on messenger apps in 2014 than texting, the comeback of instant messaging is old news. However, a new product from Microsoft, shown off at CES 2015, gives messaging apps a new significance. Microsoft revealed a new Nokia model, dubbed “the most affordable Internet-ready entry level phone yet.” While Nokia 215 doesn’t run Windows Phone OS—which means it’s not technically a smartphone—it’s preloaded with Facebook Messenger to give users in emerging markets more options for connecting with others. Given both Facebook’s and Nokia’s popularity in countries with millions of mobile-first users, such as India, this could mean a huge boost to Facebook Messenger’s app popularity, as well as a hefty addition to Facebook’s active user base. What does this mean for digital marketers? For once, it’s a good reminder to revisit ways to identify referral traffic that may be sneaking in undetected through Facebook Messenger; and while there are no sure-fire ways to enable sharing through instant messaging, it’s worth focusing on creation of shareable content. Despite being a popular item at the Consumer Electronics Show this year, selfie sticks are a thing of the past. Now, forward-thinking techies are documenting their lives with “dronies”—a photograph taken using, you guessed it, a drone. One of the products highlighted at CES 2015 combined the show’s most popular gadget categories, wearables and drones, into a kind of instant-selfie boomerang. Nixie is a bracelet that the owner can take off, throw in front of them, and have it snap a photo while airborne—in short, a perfect selfie drone. Another drone used for similar purposes, which just concluded a wildly successful fundraising campaign in the UK, connects to the smartphone and tracks it from a distance of up to 100 feet, allowing the user to compose photos of themselves beyond the reach of a selfie stick. While dronies are a bit of a wild-card social media trend, as their grounded counterparts, selfies, have been before multiple breakthroughs in 2014, it’s fascinating to see drones continue to become more affordable, wearable, and adaptable to multiple purposes. So this isn’t a call to hurry up and get a selfie drone for your marketing department yet, but it’s worth keeping up with the trend to see if it will—ahem—take off. Did you notice any other social media trends discussed at CES 2015? Share them with us in the comments!